Buy this item and earn 5,924 ClubPoints. RK-DVX2U receives an extended signal supporting two DVI-D screens and USB 1.1 devices (per receiver) up to 275 feet away from a transmitter using CAT-6 cables, while retaining perfectly clear, crisp image (image resolution up to 1900 x 1200 at 60Hz) quality. 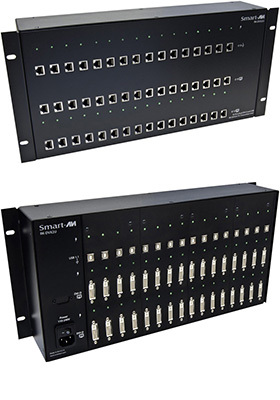 Each RK-DVX2U system consists of a powered rack-mount chassis populated with receiver cards, located up to 275 feet away from the transmitters (purchased separately - see below). CAT-6 STP cables (not included) connect each transmitter to a receiver unit. Each receiver connects to the user's interface console (USB keyboard/mouse, USB peripherals and two DVI screens). 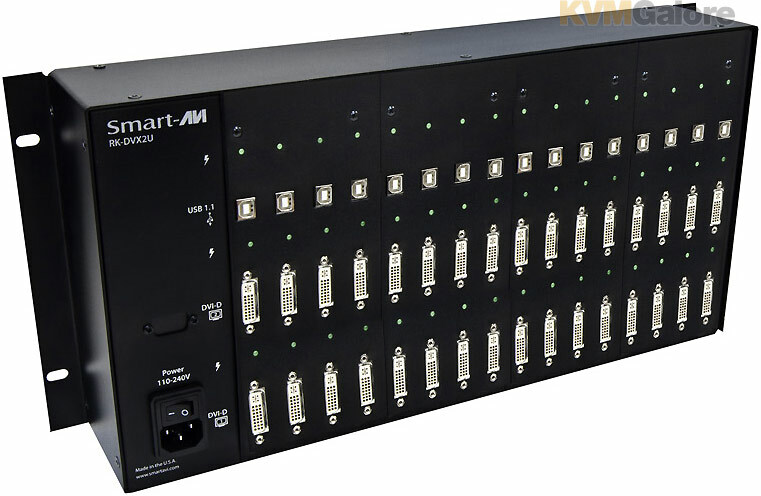 RK-DVX2U is the ideal way to consolidate up to 16 workstation computers into one location. The RK-DVX2U features dual DVI-D extension up to 275 feet over STP. It is fully compatible with Mac, PC and Linux DVI standards. RK-DVX2U also features transparent USB 1.1 signal extension, with full support for all USB 1.1 devices and an integrated 4-port hub in the receiver. Flash drives, printers, cameras, scanners, etc. may all be used with the RK-DVX2U. • Medical: In the medical field where sensitive electronic devices are used, isolating workstation computers can be a matter of safety. The RK-DVX2U allows the workstation computers to be housed in a central location, away from sensitive devices. • Industrial workspace: In industrial work areas that may be too harsh for a workstation computer, the RK-DVX2U can consolidate the computers into a safe location. 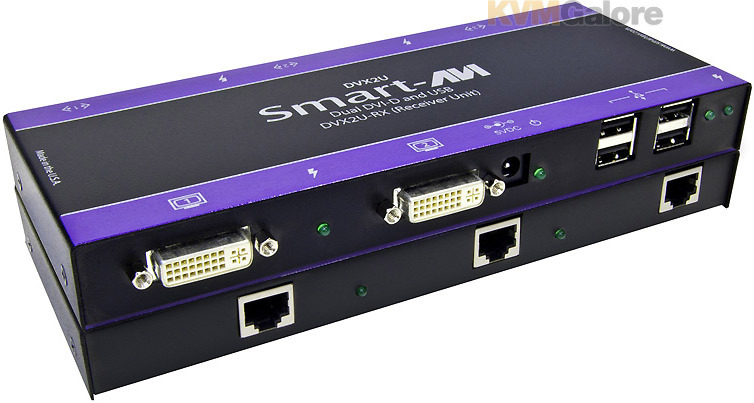 • Digital signage: When it comes to Digital Signage, the RK-DVX2U is an excellent deployment option. With the RK-DXV2U, up to 16 digital signage devices can be centralized and secured from public access. • Information Kiosks: As with most information booths and kiosks, there is a risk of damage or theft. The RK-DVX2U is the best way to secure computer hardware, by consolidating it to a secure location away from public access. • Film/music recording studios: When recording with sensitive cameras and microphones, computers are often too noisy to be used in the immediate vicinity. The RK-DVX2U isolates the computers into another room, maintaining the silence that recording artists require. 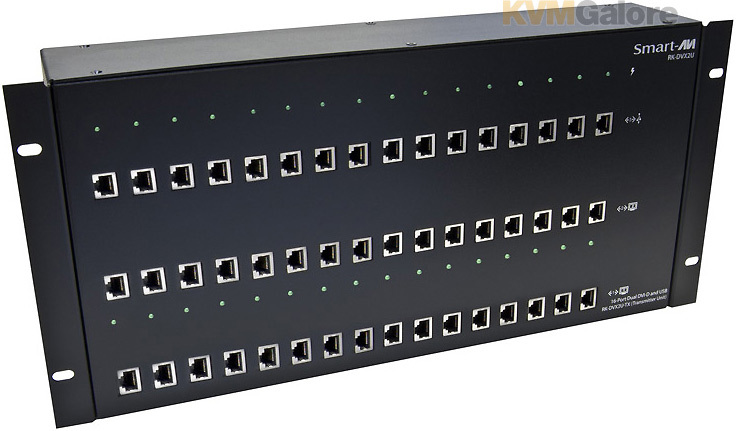 Listed below are additional products to consider which are compatible with High-Density Dual-DVI USB KVM Extender - 16-Port Receiver. These items may be required to complete your system.